MOHAMED MOULDI KEFI, Minister for Foreign Affairs of Tunisia, saluted the martyrs and youths of his country’s peaceful revolution for freedom and dignity. “This historical event actually infused a new hope into the conscience of humankind that yearns for justice and democracy, and holds high the values of freedom and human rights,” he said. Tunisia yearned for democracy based on pluralism and peaceful alternation of power, and the provisional Government was exerting every effort for a smooth transition. The Higher Authority for the Achievement of the Revolution Objectives, Political Reform and Transition to Democracy had been established to fulfil the people’s aspirations for a democratic, sound and quiet transition. He said that Tunisia’s Government, whose competence and integrity was common knowledge, was in charge until a Constituent Assembly was elected in free, transparent fashion on 23 October. Then, a new Constitution would be drafted to consecrate popular legitimacy. “We are utterly confident that these elections will be a success by all standards, and that success will be clearly confirmed by national as well as international observers, who will attend this momentous political event,” he said. Protection of human rights and civil liberties were top Government priorities, and several international organizations dealing with those issues had opened offices in Tunis, including the Office of the United Nations High Commissioner for Human Rights (OHCHR) and the Office of the United Nations High Commissioner for Refugees (UNHCR). Tunisia also strongly appealed for repatriation of its people’s assets taken by the former President and his family members and in-laws, which were greatly needed at the present very special juncture, he said. 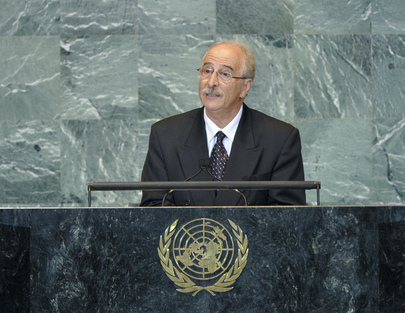 “It is actually a very sensitive period fraught with tremendous economic and social challenges.” Thanking countries that had responded to extradition requests for persons convicted of crimes, he asked for those that had not responded to show more efficiency in observance of principles of international solidarity. He thanked the G-8 and international institutions that showed support in the transitional process, as well as the United Nations, regional groupings and other friendly countries for precious contributions. Tunisia would do its utmost to help the people of Libya achieve their legitimate aspirations towards democracy, he pledged. Arab unity could only come from common and daring political decisions and consensus on League of Arab States’ concerns, on top of which was Palestine. Tunisia strongly supported the Palestinian bid for United Nations recognition, and called for support of its full membership, strongly condemning the illegal embargo on the Gaza Strip and Israel’s recent military aggression. While congratulating Egypt on its successful revolution, Tunisia hoped peace and stability would be restored in Syria and Yemen to meet their peoples’ aspirations for freedoms and reforms. “Tunisia will strive to retrieve its position within the United Nations in a way that reflects the awareness and aspirations of its people as well as its long-standing history replete with positive contributions to international relations,” he said. While stressing his country’s commitment to enhanced cooperation with other nations, he called for initiating reform of the United Nations, mainly through enlargement of the Security Council’s membership to ensure permanent African representation. But while politics, crises and wars represented the Organization’s major concerns, addressing economic and development questions would enable eradication of the causes of conflict.